It’s that time again, and it doesn’t feel like it’s been that long since Oath of the Gatewatch, does it? Just yesterday, we were gushing about the new Eldrazi cards and going wild over the broken state they left Modern in, a problem I fully expect to be remedied with a banlist update next week. Okay, with that in mind maybe Oath of the Gatewatch, while hugely impactful on Magic’s history, wasn’t actually that great. Luckily, Shadows over Innistrad is. This set looks poised to deliver in a way that Battle for Zendikar and to a lesser extent Oath of the Gatewatch did not. While the BFZ draft format was fun (and got much better with Oath), the block itself didn’t blow everyone away in the traditional sense. 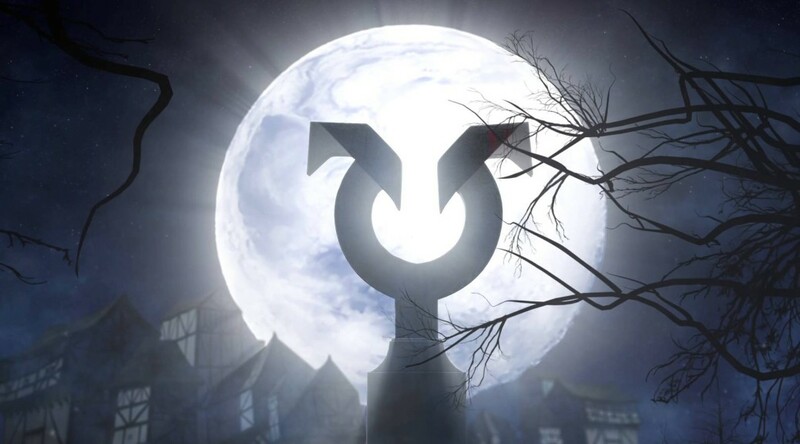 Still, the introduction of the “sixth color,” or in reality colorless mana, was a touchstone moment in Magic’s history, and we’re going to see the repercussions of it for years to come. Whether it’s with a return of Eldrazi or something else, or maybe just making colorless evergreen, Oath will forever change the future of Magic thanks to that step. Which brings us to Shadows over Innistrad, which must follow up on that set. And while it’s not going to be hard to break Modern “less” than Oath did, the truth is Shadows isn’t just living up to the shadow of Eldrazi – it has to live up to the storied history Innistrad brought to the game. Namely, that means an incredible Limited format — certainly one of my personal top three since I started in 2009, and for many a top three overall — as well as a pretty diverse Standard meta that despite the crazy powerful cards in Liliana of the Veil and Delver of Secrets was actually fairly diverse with some fun interactions. All that said, is there any way Shadows over Innistrad can live up to the hype? I know a lot of people didn’t love what Werewolves did to a draft. And having watched the Top 4 of a Team Limited event have to deal with a double-faced card (Chandra, Fire of Kaladesh), I can understand the trepidation. They give away colors, show power picks and generally just kind of mess up a draft environment. That said, the mechanic works great once you actually sit down to play. The tension between flipping and re-flipping cards in Limited leads to really interesting games, not to mention how it oozes flavor. Arlinn Kord is one of those. 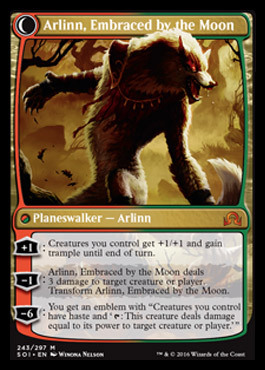 Our first Werewolf planeswalker, this is the most fun you can having flipping walkers since Garruk Relentless. And the power level might even be higher than that format staple version of Garruk. 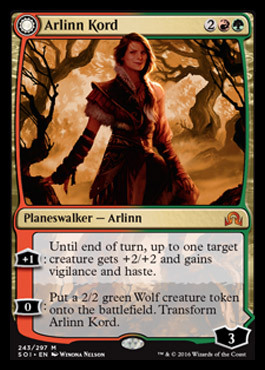 Arlinn hits the battlefield ready to pump a member of your team to really get in there, or comes down after a board wipe to refill your board and create a blocker to protect herself for the flipside. And the flipside is nuts. 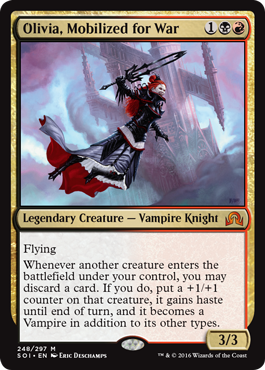 Keeping with the aggressive theme, she can get your entire team in there, or play the quintessential midrange game, gunning down an opponent’s creature and then flipping back to make more wolves. This is about everything a midrange deck could want in a planeswalker, and it happens to come with an ultimate that can end the game when needed. Speaking of attacking, very few cards enable that as well as our new, slimmed-down Olivia Voldaren. Whereas the original Olivia was a powerful late-game card that took over by itself, new Olivia brings her friends to the party and makes sure they’re ready to rumble. Not only does she turn excess lands into haste and pumps — a pretty great way to mitigate flood in aggressive decks — but the real benefit comes from this being an incredible Madness enabler. While some of the other Madness enablers we’ve seen require a mana cost to use, Olivia simply asks that you cast a creature anywhere on your curve. This means you can tailor the cards you’re casting to the cards you’re pitching to Madness, and that means the value is undeniable. Whether it’s a sweet creature like Asylum Visitor or “just” a removal spell like Fiery Temper (and let’s be honest, it’s gonna be Fiery Temper), Olivia does exactly what you want a 3-drop to do. One of my favorite things about the original Innistrad was the tribal theme. I’m really glad they kept that around for our return to the plane, because the fact that there was just enough payoff in Draft to go mono-spirits or werewolves added a lot of fun to that format. After all, linear decks are usually fun to build and play — not to mention they are a great guidepost for newer players — but when they’re simply another deck rather than all the decks like in Lorwyn block, it adds a nice touch to Limited. In Constructed, I certainly had fun playing Werewolves tribal because Full Moon’s Rise was awesome and Immerwolf was absurd, but the rest of the tribes had more success than my FNM deck. Namely, Spirits and Zombies did well, and Zombies in particular was a great deck to have in Standard because it was just so flavorful. I know not everyone cards about flavor, but I think Magic is in a great place if the think the Zombie deck does is exactly what the average person would answer if you asked them what a Zombie deck should do. Diregraf Captain was a boss, and with Gravecrawler and Geralf’s Messenger the zombies just never stayed dead. Relentless Dead is the perfect continuation of that. 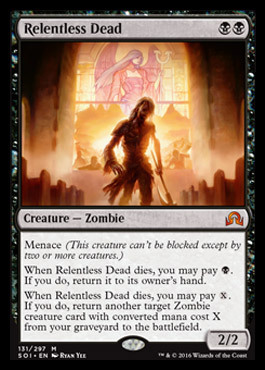 Not only does it reference the art of Endless Ranks of the Dead in an awesome throwback, but it’s a great card on its own. It’s a good 2-drop that’s hard to block and keeps the pressure coming, but it’s also an incredible insurance plan against board wipes or, you know, combat in general. This time around, the dead aren’t just endless — they’re relentless as well. These aren’t the most flashy cards in the set, but I truly believe they’re some of the better designed ones. It shows that even after nearly 25 years of making lands, Wizards can still deliver new designs that make for fun gameplay. The beauty is in the simplicity. Look at Landscape; it seems incredibly similar to lands we’ve had in the past (Panoramas), and the design is so simple it seems almost surprising it hasn’t existed before. 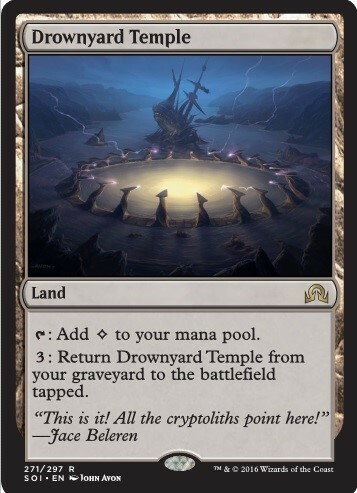 But somehow here we are, with a new land that will not only be an important Limited pick and a great card for new players to fix their mana inexpensively, but something that takes on a whole new light in the wake of Oath of the Gatewatch. All that wrapped in a simple package we’ll be taking for granted in two months’ time. Temple is more exciting on its surface, and I’m looking forward to digging deeper. Again, it’s a novel effect we’ve only even come close to with Dakmor Salvage, but Temple’s simple design opens up all kinds of room. Will the Modern Life from the Loam deck want it? What ways can we make use of sacrificing lands? Is there a better feeling than sacrificing this to Titania or Dust Bowl? 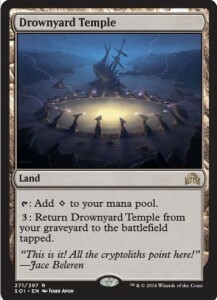 While those last two may only feel good for one side of the interaction, the fact this card has me asking these questions for the first time 20+ years into Magic’s existence has me excited for the possibilities. It almost seems like a card that should exist in the next Un-set. But instead here it is in its 13 fully bloody shades of glory. It’s true “gimmick” cards like this can cause the community to divide sharply. But truth is these are incredibly exciting to a portion of our community. I figure people who don’t like it can ignore it and move on. At least, they should live with it, because it’s just so darn fun. It’s probably not even “good” in the traditional sense of Standard power level. With painlands in the format, not to mention the duality of its effect – this won’t be winning any Grand Prix or PT Top 8s anytime soon. But you better believe someone is going to die to it at FNM. And you better believe the wielder of 13 will remember that story forever. More than that, this card exemplifies all that’s right with top-down design. It’s fun, incredibly flavorful, and every single piece of this card just works. Thirteen bricks, 13 blood stains, 13 words in the lines, 13 logs, etc. Hell, there’s even 13 words in each sentence preceding this in this section. Spooky. It goes on and on, and this is sure to be a fan favorite for years to come. 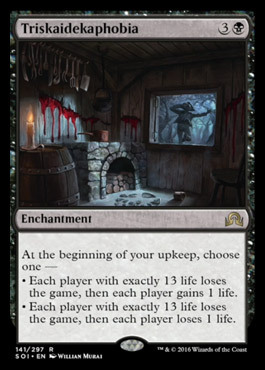 And while Triskaidekaphobia will undoubtedly take the title of both “most flavorful” and “most unpronounceable,” it’s just the tip of the 13-sided iceberg when it comes to flavorful cards in Shadows over Innistrad. From Thing in the Ice to Startled Awake to Relentless Dead to Shard of Broken Glass to Sinister Concoction, to the Escape Rooms at the Triple-Grand Prix weekend, to the Avacyn reveal in Detroit with the wonderful Christine Sprankle cosplaying, the ties between flavor and gameplay have never been stronger. We’re slowing unraveling the pages of this mystery as we investigate further. It’s going to culminate with the reveal of who the Shadow is on Innistrad (Emrakul? Marit Lage?) and then we’re going to fully immerse ourselves in the twisted world of Innistrad. haha i was thinking the exact same thing. poor terminal moraine. Oh no! 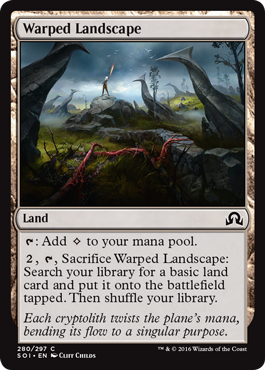 I hadn’t seen that card before, nor did I see it when I researched some similar lands. Today I learned.